Thus was born the classroom membership. 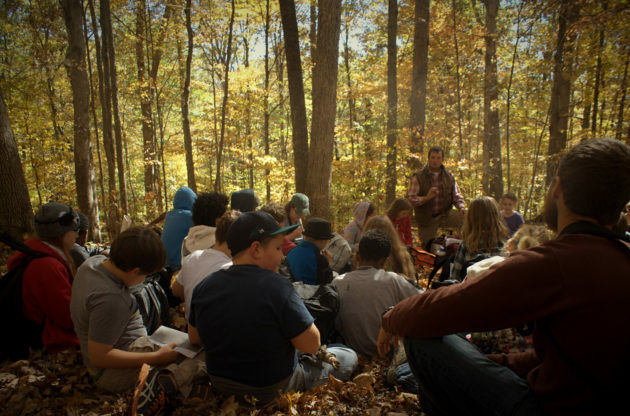 A classroom membership to Sycamore Land Trust is only $20. The first $20 donated by a classroom goes toward operational expenses related to land conservation. Additional amounts are invested in our Monarch Environmental Education Endowment Fund to ensure that the educational programming provided by Sycamore will forever be free, in much the same way that Sycamore’s land acquisitions will forever be protected. We are nearing our goal of $1 million for this endowment; contact us to learn more about how you can contribute! Jennifer Lewis is a first grade teacher at Marlin Elementary with Monroe County Community Schools (MCCSC). In the spring of 2017, her kindergarten class became the first official Sycamore Classroom Member. Sycamore’s Environmental Education program partnered with this class throughout the entire 2016-17 school year. At MCCSC’s Templeton Elementary, Sycamore’s Environmental Education program partners with many classrooms. Students, teachers, school custodians, and Sycamore staff have worked together to revamp the Children’s Garden and to plant native plants in the circle drop-off drive. This project is funded by a grant from Duke Energy and includes site preparation, mulching, and planting. To become a classroom member, contact Shane Gibson at shane@sycamorelandtrust.org.